2018 Lucas Oil NCHA Super Stakes � April 13, 2018 � Fort Worth, Tex. Following one and a-half days of Super Stakes Open go-round competition, Judgement Day, shown by Michael Cooper for Rose Valley Ranch, Weatherford, Tex., and Mister Metallic, with Matt Miller for Texas Holy Cow Performance Horses, Santa Ynez, Calif., carried the standard with 222 points. 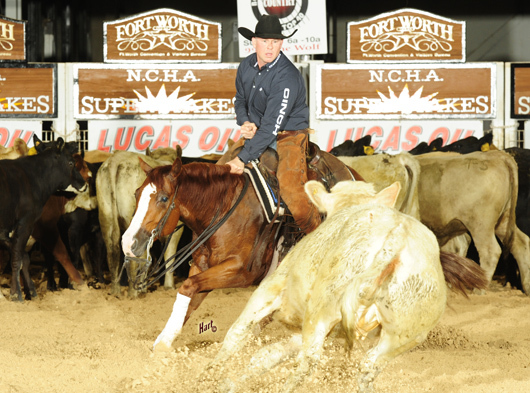 Pharrel, also shown by Michael Cooper for Rose Valley Ranch, and Summer Shandy, with Jesse Lennox for Rocking P Ranch, Fort Worth, Tex., tied with the second-highest score of 220 points. Coincidentally, Judgement Day, by High Brow Cat, and Pharrel, by Metallic Cat, are three-quarter brothers out of Bet On Houston LTE $42,089, by Peptoboonsmal. Mister Metallic, ridden by Matt Miller. Hart Photography. 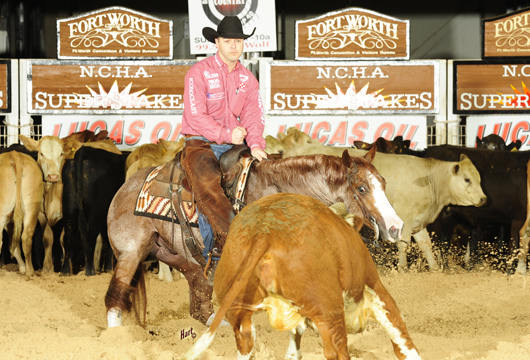 Mister Metallic, by Metallic Cat, is out of Smart Crackin Chic, winner of the 2006 NRCHA Snaffle Bit Futurity, and dam of SCR Hydrive Cat, by Hydrive Cat, owned by Singleton Ranches, Lamy, N.M., and one of four horses who scored 219 points in the Open go-round, including SDP Hy Jane, by Hydrive Cat, and shown for SDP Buffalo Ranch, Fort Worth, Tex., by Christian Miller; Cool N Hot, by Hottish, shown by Kobie Wood, for Paula Wood, Stephenville, Tex. ; and Bayou Metallic, by Metallic Cat, shown by Lindy Burch and owned by Barlajam Cutter Partnership, Oklahoma City. Judgement Day, ridden by Michael Cooper. Hart Photography. Judgement Day LTE $49,905, a full brother to Bet On A Cat LTE $381,154, was a 2017 NCHA Futurity Open finalist (16th) and a 2018 Arbuckle Mountain Open finalist (8th) with Michael Cooper. His dam, Bet On Houston, bred by Oxbow Ranch, was a 2005 NCHA Super Stakes finalist (12th) under Lindy Burch. Pharrel LTE $53,686, also out of Bet On Houston, placed third this week in the NCHA Super Stakes Amateur Unlimited with his breeder Gary Rosenbach, owner of Rose Valley Ranch, who also bred Judgement Day. Mister Metallic LTE $15,840, a full brother, out of Smart Crackin Chic, to Mistresssis LTE $165,625, and Metallic Mistress LTE $160,527 was a finalist this year in the Cattlemen’s Derby and the Ike Hamilton Derby Open with Matt Miller.